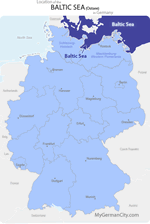 Germany’s Baltic Sea coastline curves like a reclining “S” along the edges of its two northernmost states, Schleswig-Holstein and Mecklenburg-Western Pomerania. Its location provides the sort of turbulent changes in water and air which inspired expressionist painter Emil Nolde’s dramatic palette of deep blues, reds, purples, and even black. When you visit, you’ll be following in the footsteps of some 20th-century giants, including Albert Einstein, Sigmund Freud, Thomas Mann, and Billy Wilder. The area might have had its strongest influence, however, on the great poet Gerhard Hauptmann. All these men found the Baltic Sea Island of Hiddensee irresistible. Begin a tour of the Coastal “S” in northeastern Schleswig-Holstein. Although this part of Germany has fallen on rather hard times because of its lack of industry, it was once one of the wealthiest regions in all of Europe. Here was born the Hanseatic League, which controlled the land and sea routes necessary to Baltic traders. Schleswig-Holstein’s capital Kiel, with its mighty canal, is the most industrial city on the German Baltic Coast. Traces of Hanseatic glory remain in Lübeck. Lübeck’s Altstadt has more structures built between the 13th and 15th centuries than any other city in northern Germany. The city’s architectural importance has earned it recognition as a UNESCO World Heritage site. Within the town’s Altstadt are the Salt Lofts (Salzpeicher). These six Renaissance buildings were used to stored Lüneburg salt, considered the “white gold” of its day because it was essential for preserving food. Lübeck is also where you’ll find the gabled home of Thomas Mann’s grandparents. He’s said to have used it as the inspiration for his immortal novel Buddenbrook. The second curve of the Baltic coastal “S” lies between the Bay of Lübeck and the Stettiner Haff. It’s an irregular coastline with dozens of bays, peninsulas, and islands interspersed among other Hanseatic towns and oceanside resorts. Get a genuine flavor of life in Hanseatic times by visiting Wismar, with its medieval streets and colorful old harbor. Don’t miss the Nikolaikirche, a Gothic masterpiece in Baltic brick with an interior ceiling soaring over 37 m or 120 feet. To the north of Wismar are the seaside resorts of Kühlungsborn and Heiligendamm. Heiligendamm, politically part of Bad Doberan, is frequently called “the White Town by the Sea,” because of the dazzlingly white seaside villas where royalty basked in the bracing sea air. The city of Rostock, on the River Warnow southeast of Kühlungsborn, underwent the biggest transformation of its 800-year existence when the GDR made it an international port. At the Shipping Museum (Schiffahrtmuseum) you’ll get your fill of fascinating tales of life at sea. Here is the oldest university in Northern Germany, and the site of the annual August Hansa Sail, an August regatta which draws a million visitors from around the globe. At Stralsund, another Baltic Sea diamond, you’ll find an exceptionally well-preserved Hanseatic town with homes dating to before the Thirty Year’s War. A big surprise — made of thin air — awaits you behind the seven gables of the medieval City Hall. Hop on a boat and set sail for magical Hiddensee, where cars are verboten, and the island’s four small villages play second fiddle to its northern cliffs and lighthouse. If larger islands are more to your liking, Germany’s largest awaits across the Rügenbrücke from Stralsund. Rügen’s 386 sq. mi/1000 sq. km can best be seen aboard the Rushing Roland. Ride the train to the island’s coastal resort of Binz, with its piers, promenade, and historical Museum. On a hilltop south of Binz is Prince Wilhelm’s Granitz Hunting Lodge, with a sweeping view of the UNESCO Biosphere Reserve covering that end of Rügen. Don’t leave without visiting the white cliffs of Jasmund National Park, where you can take a shuttle bus to the clifftop outlook at King’s Seat or Königsstuhl.